Earlier we talked about a module to allow specific notes to trigger individual stages on a Q960 sequencer. 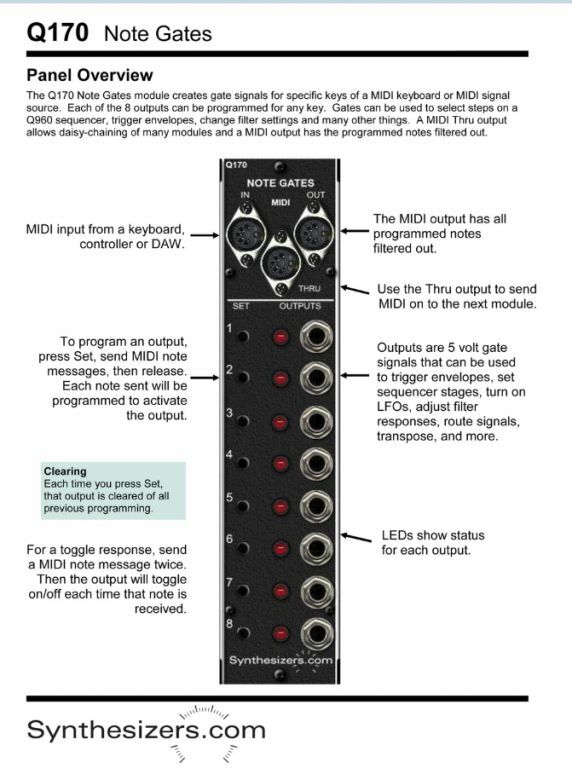 This module would take MIDI in and have 8 gate outputs. MIDI notes could be programmed to activate any of the gates. 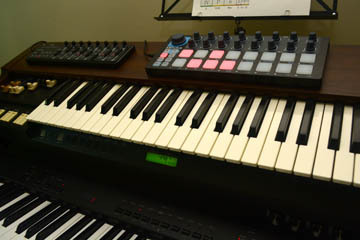 So a specific key could be programmed to start a sequencer, trigger an EG, adjust a filter, transpose, etc. There seems to be enough interest verbally. I've put a pre-order item on the Quote form in the SPECIALS section to test real interest. If there is not enough interest then I will return your money. Will make the decision mid-July and first production will be 30-60 days from then. Provides some of the functionality of the CV.OCD. The CV.OCD has 12 configurable gate outputs in addition to its 4 CV outputs, but is an outboard box with separate power. The Q170 lacks CV outputs, but adds MIDI note filtering and of course is "ready to go" in MU format with standard power. First thing I thought of would be an easy way to trigger drum modules using a groovebox/sequencer or DAW! Thanks John for posting the picture. I should have done that but haven't done it on Muffwigglers and didn't realize I could just up load it rather than linking it. I am in an agreement that its a pretty neat idea. I hope there is enough interest for it to go into production. I'm just not ready for it up yet. this thing is one of the best bang for buck things around.. be interesting if roger did a Q170b that was 8 cv outs.. to pair with Q170. Polyphonic aftertouch in a module? ... uh'want muh damm Q114++ aid !! ... where's the bloody 4ch VCA Mixer !!!?? ... er 3 ch anyway !!! DAMMIT!! Ya pay for this stuff and he don't deliver!! I'm not trolling or being negative, this is just something that really lines up with that philosophy and I think it's really cool. $155.00 .... hmmm ... not bad, less than I expected actually. I just put in a $2k order with him, so I'm tapped and cannot participate. In any case this thingy may actually be something quite viable. Only thing is, my imagination runs short on what (exactly) I would/could do with such a thingy. I don't own a modular sequencer, so my head just doesn't think in the modular sequencer owner/user range of ideas. Yea .... I'm still in the Beatstep Pro kiddie pool. I'm good with the 16 channel sequencer in certain digital power synths however. None of which is relevant in this case. Anyhow, $155.00 seems pretty fair! Only thing is, my imagination runs short on what (exactly) I would/could do with such a thingy. Well, the Q170 paired with a Beatstep Pro* or ordinary Beatstep* (fits perfectly on top of my old XB-2) gives you "remote control" of any 8 binary (two state, non-continuous) modular parameters. Use with EGs or attenuators to toggle between voltage levels. Couple it with VCAs or even Panner/Faders as signal gates. Sequencer not needed. * = In controller mode, not sequencer mode. When I first saw this module, I thought, "What would I do with something like that?" Then within thirty seconds, it hit me like a bolt of lightning. Order placed. And Suit, I think you're right. It is kind of a Buchla concept, or even a Serge. But, as you also say, it's cool. Dunno if it's polyphonic or not. I need to research that as I didn't even consider that. I've been getting brainstorms with it just being mono! I just do not want to spend a lot of time syncing those buttons every time I do something. Also that if I do a chord on my computer C1,D1,E1 ... that gates 1/3/5 will all fire at the same time. This also helps me out for a native instruments viewpoint, since my computer keyboard (a Doepfer lmk4+) is setup to change instrument timbers around with keyboard notes like that. (i.e. so instead of my midi channel going to a NI channel, it would go out to my 5u). btw one of those "matrixed" old school mixers I'd love to integrate to this. oK .. so let's say I set up F-A#-C as notes to trigger outputs 1-2-3 of the Q170. Play a scale on a MIDI keyboard that would include those notes ... each time one of those notes is played the Q170 sends a gate signal to a separate EG, each EG set up to change the cutoff of a filter. Would each "gate note" change the filter cutoff to whatever the prearranged amount set by each "EG note" every time one of those ~magic notes~ are played? If so, then I understand this gadget. After that it comes down to cleverly using it. "Cleverly" being the key word in that statement. While this Q170 is not strictly speaking a MIDI-to-CV converter (it defaults to 5-volt signals), with the help of other modules, it apparently can be made to behave in very flexible ways for different scenarios. You can attenuate or boost the 5-volt signal to whatever voltage you need at the moment, or trigger an envelope or slope or LFO that behaves as you want, and stops when you want, controlling oscillators, or filters or...? Kind of like the SSL seguencer, but "I'll have a double" (8 outputs and more precise control of the inputs). You could possibly change the filter cutoff to a certain prearranged knob position (I mean voltage level, because it won't physically turn the knob for you! ), or you could have dynamic cutoff changes, controlled by some voltages generated by another module, such as a sequencer. Not sure if that is what you mean by "EG note" or not? The other beautiful thing is, if you have multiple sequencers, you can start and stop them by playing single notes on a keyboard or controller. You could possibly change the filter cutoff to a certain prearranged knob position, or you could have dynamic cutoff changes, controlled by some voltages generated by another module, such as a sequencer. Great! Not that I am aiming at doing that exact thing, I was just putting out a hypothetical situation so I could verify whether or not I correctly understand it's capabilities. It seems I do. Thanks. I appreciate the response! was 8 cv outs.. to pair with Q170. + 4 assignable CV outs for less money..
yep.. seems to be a sysex dump.. done via the website.. looks pretty straightforward.. not having done it however..
One is a claw hammer, the other is a ball pein hammer. Both are hammers, but have different missions.